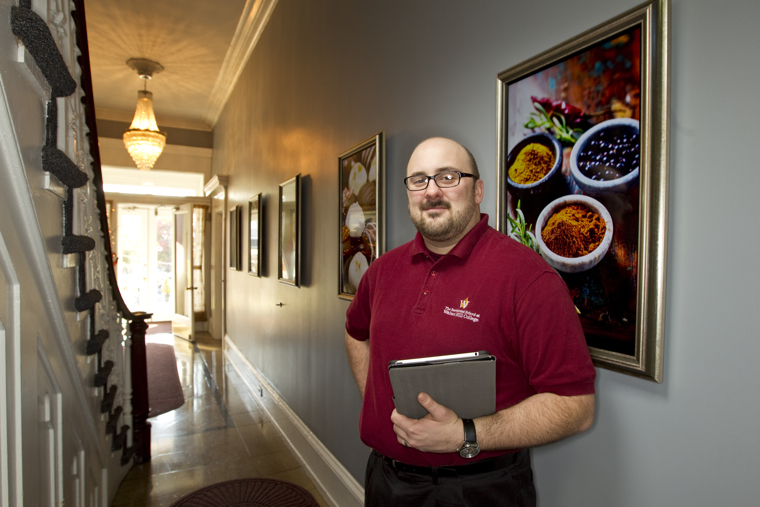 Digital signage, tablet PCs and an extensive wireless network keeps The Restaurant School cooking. Upon arrival, each student at The Restaurant School at Walnut Hill College receives a tablet computer with 16 gigabytes of memory and a Wi-Fi card (with the option of upgrading to 4G wireless). To give those 500 tablets and other personal devices network access, the school deployed Aruba wireless switches with built-in load balancing, rogue detection and fault tolerance, as well as roughly 16 access points throughout the school’s three main buildings. All of the general education classrooms, restaurants and student kitchens now provide Wi-Fi access. The wireless network also helps Finnell more effectively manage the three to four personal devices that most students bring to campus. The digital signs spread throughout campus at The Restaurant School at Walnut Hill College are an integral part of the school’s technology setup. When it completes its rollout in early 2013, the school will have 30 Samsung digital signs and two Epson projectors supporting its various digital signage applications. Samsung SyncMaster 400DXn with thin client hardware: Ten of these 40-inch screens support seven electronic bulletin boards, two main reception picture frames and a fireplace screen. The school controls them using Samsung MagicInfo Pro software on a dedicated server over an Ethernet network. Samsung UE55A large-format LCD (4): These 55-inch screens, connected using DVI cables and Samsung’s built-in video wall functionality, form one large screen or portrait wall. A small bookshelf PC, running Microsoft Windows 7 and PowerPoint that’s accessible via Virtual Network Computing software, powers the wall. As the false window covering on the UE55A was secured into place, the IT team ran infrared repeaters to all of the screens so they could modify settings without having to pull the room apart as requirements and events change. Epson PowerLite 1950 projector (2): The projectors display a slide show on two large, otherwise barren walls in the stairwells of the school’s culinary building. The school packages the slide shows on thumb drives using Epson EasyMP Slide Convertor, which means they can be set to play automatically when the projectors are powered on. Samsung SyncMaster ME32B (12): Five of these 32-inch digital signs will become a picture gallery in the main hall of Allison Mansion. Among the remaining seven, two will be used in kiosks and five in an installation at another of the school’s buildings. With the exception of the screens earmarked for the kiosks, all will run slide shows contained on thumb drives using MagicInfo Lite. Samsung SyncMaster ME32B (3): Two of these displays will be used for the school’s interactive spice and herb wall in the back hallway of the culinary building, and the third will be used as an information kiosk. The hallway displays run MagicInfo Lite and have their own onboard storage. Read more about The Restaurant School's technology initiatives here.